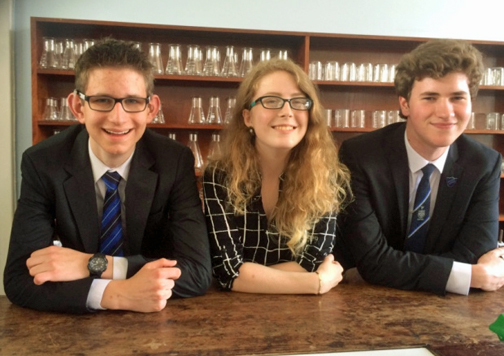 Flying soon to the US will be three students from the Isle of Man where they will study at the NASA United Space School with astronauts, engineers and scientists, as part of the ManSat Scholarship program. Since the start of the ManSat Scholarships, 30 students from the Isle of Man have won these coveted assignments. This year's students include Rose ten Donkelaar from Ramsey Grammar School, Laurence Couch from Castle Rushen High School and Julius Herzig from King William’s College will fly to Houston later this month after winning the annual scholarships that are provided by Manx satellite firm ManSat Ltd. The students will spend two weeks at the Space School and will live with US families and as they work with peers from 21 other countries, all focused on planning a simulated mission to Mars. Julius Herzig, Rose ten Donkelaar and Laurence Couch, ManSat scholarship winners for the NASA Space School. ManSat carries out satellite filings for the Isle of Man under a contract with the government’s Communications Commission.The company first offered a scholarship to the United Space School in 2000, with Jennifer Stone the first student to win a place. Last year, having spent several years studying and working in Japan, Jennifer returned to take up a post with ManSat. In 2007, ManSat started offering two scholarships a year to the Space School, always working in cooperation with, and with the support of, the Department of Education and Children. ManSat also supports the annual Conrad Spirit of Innovation competition for Manx high schools. This is managed in cooperation with Apollo Astronaut Pete Conrad’s Foundation and has sponsored Island high schools to participate in the UK Rocketry Challenge. In addition, the company awards an annual ‘ManSat Fellowship’ grant, for Manx students seeking to further their studies in space and scholarships to the programs run by the International Space University in Strasbourg. Chris Stott, the head at Mansat, said the company was delighted to be offering three scholarships this year and he's quite certain that Rose, Laurence and Julius will have a fantastic time and make many new friends and contacts, with many of the previous scholarship winners having gone on to forge successful careers within the space industry. Tim Crookall MLC, Minister for Education and Children, indicated this his department greatly values the ManSat scholarship, which has enabled many students to have the experience of a lifetime at Space School, enumerating that the combination of Science, Technology, Engineering, Arts and Math—S.T.E.A.M. education—is a powerful one for the 21st Century workplace.